Obesity is a growing problem around the world. The obese adult is at higher risk for diseases such as heart disease, diabetes and some cancers. The water provides a medium that allows maximum participation and caloric consumption while minimizing risk of weight bearing and over use injury. Aquatic exercise encourages and motivates the larger adult by providing a safe and effective environment. 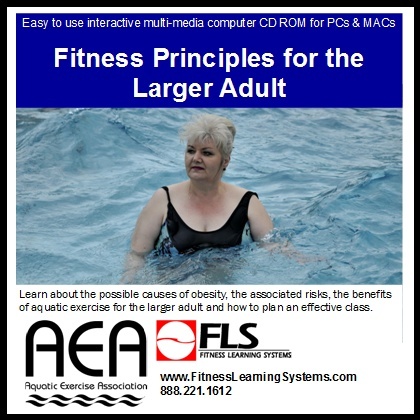 In this course you will explore aquatic exercise as it relates to the larger adult. Special considerations for the obese participant, as well as exercise format and physiological differences, are included in this course. Review intensity and safety concerns and see an example of an exercise program for larger adult clients. State the magnitude of the obesity problem in the USA Population. Be able to provide a definition of obesity. Understand the possible causes of obesity. Provide the risks associated with obesity. Provide the benefits of aquatic exercise for the larger adult. Effectively plan an aquatic exercise class for the larger adult.